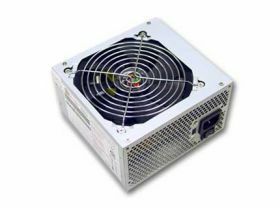 This 550W power supply boasts its powerful and quiet performance by installing 120mm ball bearing fan with a 75CFM air flow and 2000RPM speed. The power was integrated with dual SATA connectors, four 4-pin molex connectors, one 20pin+4pin ATX connector and one P4 4pin connector. It was made by sturdy Korean made anti-rusty steel to ensure the life time performance. It is 110~220V switchable. With high efficient 680uF 200V capacity, it supplies with steady and clean DC power output.